Not everything in life goes according to plan, and not even fame and fortune can change that fact. Travis Barker, who is most notable for his role as drummer for band Blink 182, has also had many obstacles to face. His most recent was completing this ’71 Blazer as an all around urban assault vehicle. The goal was to create a vehicle that could battle the tough streets of the Los Angeles area. 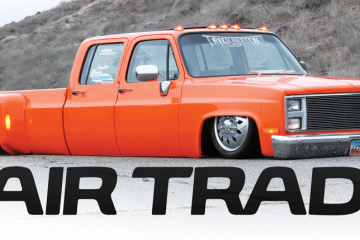 It might sound odd to purpose-build a lifted truck to drive the streets of L.A., but if you’ve ever driven the roads there, you know that their surface quality is so bad that having a high-clearance vehicle is almost a requirement. The factory seating remained intact and was Reupholstered by Fat Lucky’s. As a celebrity musician, Travis is well known around globe and has his fair share of greenbacks stuffed in his mattress. This might make you think that he’s pretty much invincible, but you’d be wrong. As you might already know, in 2008 Travis was involved in a plane crash where he is now the only survivor. As he ﬂed—on ﬁre—from the wreckage, he thought that his life was over. His recovery in the hospital during the ensuing months was extremely painful. The one thing that kept him going through all of the surgeries was his love for his kids. Though Travis is recovered, years later he’s still shaken by the whole ordeal. Because of his near-death experience he’s more involved in his kids’ lives than ever before, and he takes them to and from school on a regular basis. 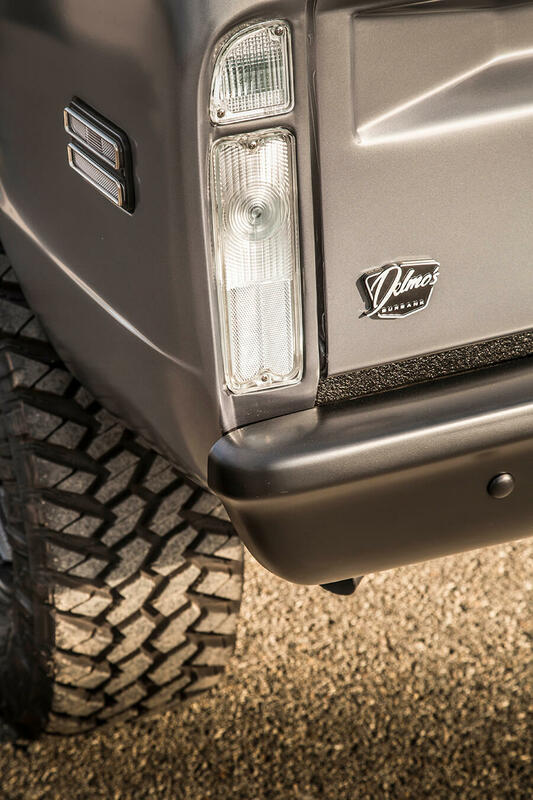 That’s where this 4×4 Chevy comes into play. Travis wanted it to be an unstoppable cruiser reliable enough to take his kids to school and on other (more exciting) adventures. 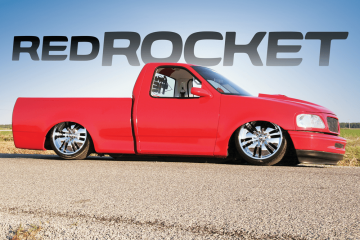 So, whoever was going to build the truck would have to be trustworthy enough to make it a reliable daily driver. 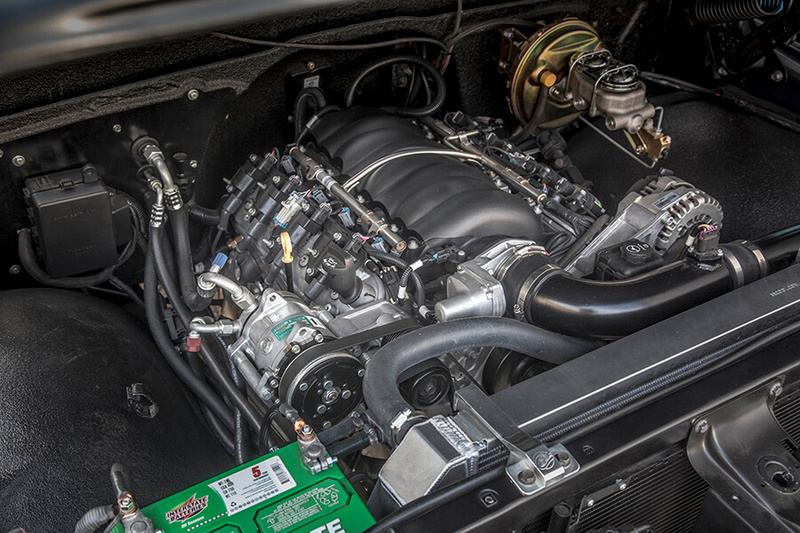 Powering this beast through the streets of Los Angeles is an LS3 GM crate engine backed with a 4L70E transmission. The whole deal started off when Travis purchased the Blazer off eBay and took it to what he thought was a reputable shop in Burbank, California. Six months later, he walked down the road and discovered Delmo’s Speed & Kustom when the shop was still in California. Travis liked what he saw at Delmo’s and it made him rethink some of his decisions. Since the truck had been sitting for long time at the first shop with no signs of progress, he pulled it and took it straight to Delmo’s. The crew at Delmo’s tore the truck down to bare bones to rebuild it from the ground up. The chassis, 6-inch lifted suspension and front and rear Dana 60 axles were all sent to Pacific Coast Powder Coating to be finished off in black. Meanwhile, the body was sent out to Lasky Coachworks to get its clean, menacing paint job created using BMW Gray and semi-gloss clear. Once back at Delmo’s, the Blazer was reassembled with the addition of Bilstein shocks, Black Rock Yuma series 908M wheels and Nitto Trail Grappler M/T 35×12.50R17LT tires. Since Travis wanted to make this beast a reliable cruiser, a GM LS3 crate motor was dropped in and backed up with a 4L70E transmission and Atlas transfer case. The engine is fed by air from a custom intake with K&N air filter and gas from a Classic Performance Products aluminum tank. 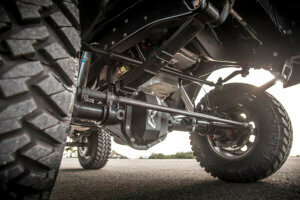 Spent gasses are released to a custom 2.5-inch exhaust with Magnaflow mufflers. All engine vitals are monitored using a set of Dakota Digital VHX gauges. The engine-mounted compressor feeds the Vintage Air climate control unit. Providing shade and protection is a custom roll cage with a canvas cover all built by Empire Fabrications. The top was also equipped with a Rigid Industries RDS light bar and rear floodlights. 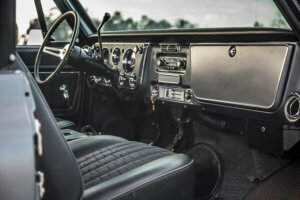 As far as the rest of the build goes, the inside of this truck looks stock with a few minor touches. 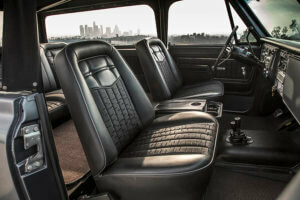 The flooring was replaced with Black Mercedes carpet and Fat Lucky’s reupholstered the factory seats. Since Travis is in the music biz, it’s a must for him to listen to his industry peers while cruising around. 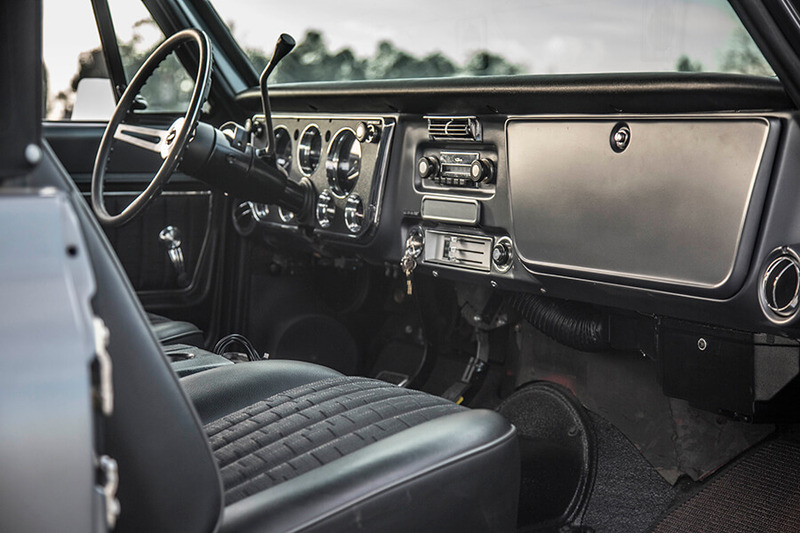 The stock radio was modified to stream tunes to a set of JL Audio speakers mounted throughout and the four 10-inch subs in a custom box mounted in the rear. 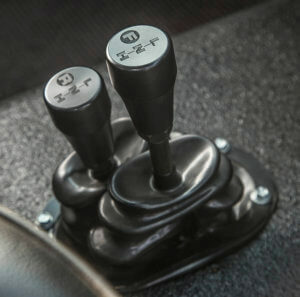 The 6-inch lifted suspension allows for the use of the 37-inch-tall Nitto tires. 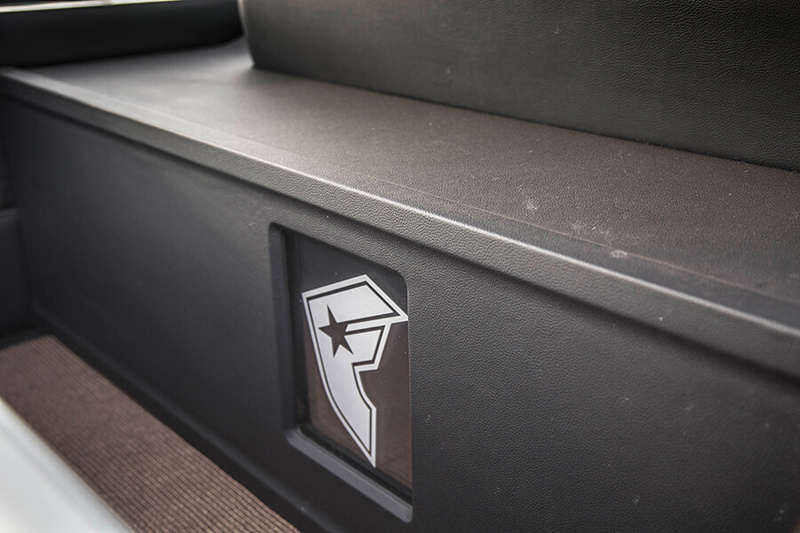 In order to blast out tunes, a set of four 10-inch JL Audio Subwoofers were added to a custom enclosure. The box was topped off with a logo for Travis’ famous stars and straps clothing brand.